The enormous popularity of the pickup trucks has made this segment very attractive for automobile manufactures which see great potential on this terrain and all-new models have been announced to come from different brands. However, we can mostly see competitive vehicles which offer similar power and towing ratings followed with well-equipped interiors. So, some refreshment may be welcomed among crowd of the conventional models. Although, some performance-oriented models are already offered from some leading brands, how about truly muscle truck. 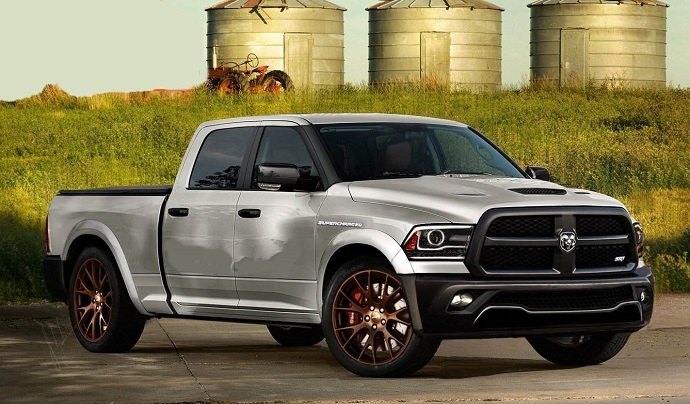 That is exactly what Ram could offer for the next model year. Namely, it has been speculated for a while that 2017 Ram 1500 SRT Hellcat may be this brand’s next undertaking. That, however, wouldn’t be the first product of this kind related with Ram because Ram SRT 10 was sport pickup truck which was produced in limited numbers between 2002 and 2004. It was powered with 8.3 liter V-10 engine which was capable for 500 HP. There are also Challenger and Charger models with Hellcat badge and why not truck powered with more than 700 HP Hellcat engine. Of course this is still unofficial but it hasn’t been rejected by the company either. So, if this turn out to be true, there is no doubt that 2017 Ram 1500 SRT Hellcat will be powered with supercharged engine which has been applied in Charger and Challenger models. This 6.2 liter V-8 displacement can produce 707 HP and torque of 650 pound-feet. We can only speculate for what performance this truck would be capable with this amount of power and considering that mentioned SRT-10 model was scored 60 mph in around five seconds 200 hp more should probably down it in the four seconds area. On the other hand, the model should probably use TorqueFlite transmission and rear-wheel drive system. But it is also possible that all-wheel drive and manual gearbox can be offered. The Ram will also have to fortify the suspension and other driveline components which will be capable to keep this model safe on the road. In that context, it must use thicker roll bar, new bushings, enhanced shocks, larger brakes and so on. The styling, of the new 2017 Ram 1500 SRT Hellcat should be expected to showcase some specific design cues which will emphasize its enormous power potential. It is natural to think that this model will adapt some styling cues from Challenger model and we could expect scoped hood, muscle-bound fenders, reshaped front bumper, etc. The model will also present other unique details like some graphic, special color treatment, SRT badges and so on. The hot-rod identity will also be complemented with large wheels that feature unique rim’s design. Interior side is also expected to get special treatment. There will surely be sports, well-bolstered seats with Alcantara inserts, unique accents on dash and door panels and high-quality upholstery. The model will also include other higher-trim features including the latest infotainment system, premium sound system, automatic climate control, etc. All this will also be followed with appropriate safety equipment. As whole project is still unofficial, the same is with the release date and price of the 2017 Ram 1500 SRT Hellcat and accurate information cannot be offered here either. However, according to some expectations the first quarter of 2017 is considered to be period when this model could be presented. As for price, it is suggested to be around $55k.